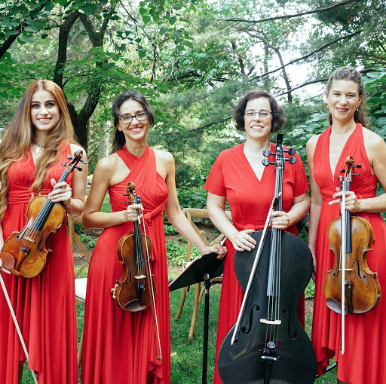 Under the direction of Ossia Musical Forum, The Red Riding Hood String Quartet has been making a splash with a diverse musical mix of virtuosic styles from Haydn to Hendrix since 2007. Concerts push the boundaries of the traditional role of string instruments, doing so with grace and edge. The quartet has collaborated with dancers, vocalists, composers, and actors. Sculpture, video, and percussion have been integrated into the group's performances in ways that are truly innovative. They uncover music not only as entertainment, but as an experience both dark and light that constantly feeds the creativity and awareness of all of us on life’s journey. Stepping into this imaginative quartet’s vibration means stepping into your own creative expansion. Contact Nora Williams for booking information.